Fly fishing guide Dan Michener walked to a partially snow-covered riverbank in Whitewater State Park. He cast a tiny nymph into the water several times then let it drift through deeper pools, hoping to entice a trout to bite. Although Michener bought his first fly rod in 1967 and is no stranger to winter trout fishing, this season is bringing him some firsts. For the first time, starting on Thursday, Jan. 1, streams in an eight-county area in southeastern Minnesota will open to catch-and-release trout fishing. In the past, winter fishing in the area was limited to only a few designated streams. 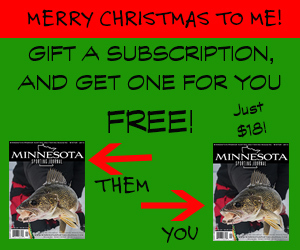 And for the first time, trout fishing in southeastern Minnesota state parks is open all year. “This is a new era for winter fishing,” Michener said. Fishing for trout in winter weather adds some unique challenges. Anglers use tackle generally designed for finesse during a season when cold and bulky clothing seem to bedevil attempts at graceful movement. Fingers stiffen up. Ice seeks to clog line guides and can foul up fly line, making casting difficult. Because of the cold, outings usually are limited to a couple hours or so. But all that isn’t stopping Michener, who has reached fishing spots in snowshoes, during blizzards and in the cold. He had good luck in the cold last winter on a designated trout stream nearby. “It was three degrees. I was in Lanesboro last year and I had really good fishing,” Michener said. Winter weather also is not appearing to stop the numerous anglers interested in winter fly fishing who have been calling the Whitewater park office and the area fisheries office of the Minnesota Department of Natural Resources with questions. The new regulations that went into effect this year make trout fishing in the southeast more accessible. In the eight southeastern Minnesota counties included in the new regulations – they are Dodge, Fillmore, Goodhue, Houston, Mower, Olmsted, Wabasha and Winona counties – anglers get a catch-and-release season that runs from Jan. 1 to the beginning of the harvest season. The harvest season runs from Saturday, April 18, to Monday, Sept. 14. Following that, southeastern streams are open to a fall catch-and-release season from Tuesday, Sept. 15, through Thursday, Oct. 15. Outside of state parks, fishing closes for two and a half months to reduce competition between hunters on private land and anglers, and during spawning of brown and brook trout. It’s a somewhat simpler story in state parks, where anglers can fish all year under either a catch-and-release or harvest season. In state parks, the new regulations include the following waters: East Beaver Creek in Beaver Creek Valley State Park; Forestville Creek in Forestville/Mystery Cave State Park; Canfield Creek in Forestville/Mystery Cave State Park; South Branch Root River in Forestville/Mystery Cave State Park; Trout Run Creek in Whitewater State Park and Middle Branch Whitewater River in Whitewater State Park. 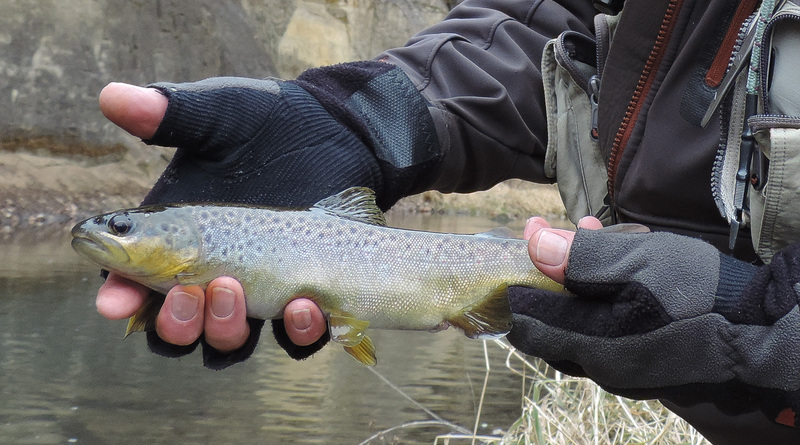 Regardless of the expanded opportunities, anglers who plan to fish for trout should still check to see if there are any special regulations, including slot limits and required use of artificial lures and flies, for the stream where they plan to fish. Winter fishing tends to be most productive between 11 a.m. and 2 p.m. Michener said that when the fishing is really good an angler can catch and release 20 fish in an hour or two. Besides the action from the fish, a winter angler can see birds and other wildlife along the river. And winter fishing is another reason to get outdoors and seek some solitude. “I think it’s a lot of people who don’t like ice fishing. They don’t snowmobile or cross country ski. You sit at home and tie flies and look for something to do,” Michener said. On that early December day, even though the fishing was slow, Michener still managed to get three strikes on his nymph, and before long the drag on his reel hummed as the rod bent sharply. He landed a brown trout. “Healthy. A great looking trout,” Snook said, looking on. Michener released the fish, which darted back toward a pool in the river under the steep sandstone banks, perhaps for another angler to catch some day. To find more information on trout fishing, including seasons and limits, see www.mndnr.gov/fishmn/trout.